CAMplete TruePath Lite – CAMplete Solutions INC.
For years customers have trusted Camplete TruePath to bridge the gap between their CAM system and 5-Axis milling machines. CAMplete TruePath Lite offers that same level of quality and precision to our customers, but instead for their 3-Axis machines. TruePath Lite provides everything needed to analyze, modify and simulate 3-Axis tool paths in an integrated 3D environment. CAMplete TruePath Lite is an effective software option for your CNC machine that saves both time and money. 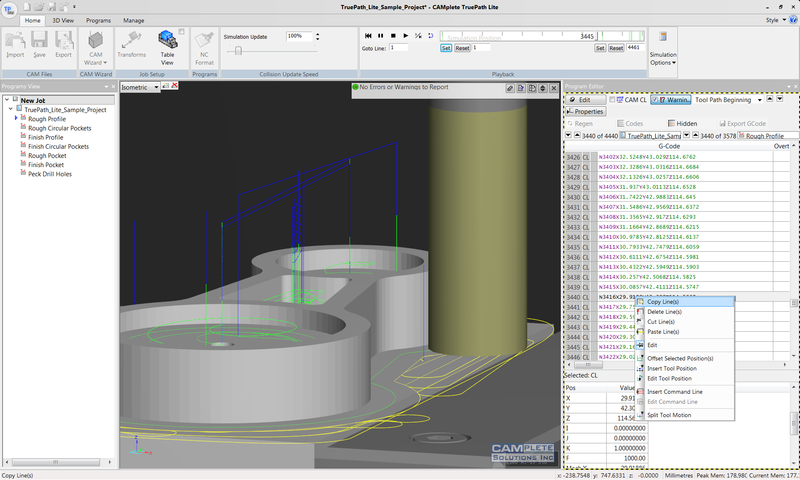 CAMplete TruePath Lite provides sophisticated yet easy to use tools for simulating and verifying 3 axis tool paths. 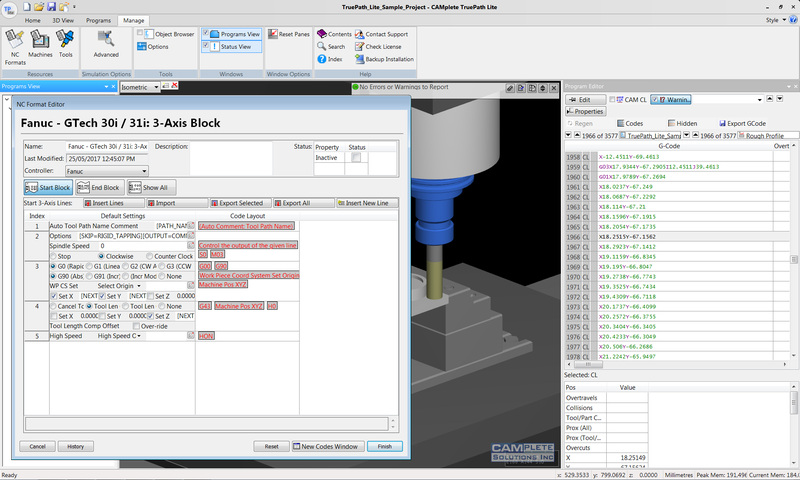 Our 3-axis simulation, shows you how your CAM programs will run on your CNC Machine. Allowing you to identify problem areas and correct them before you ever send the program to your milling machine. Machine Collision detection uses highly detailed milling machine models direct from the manufacturers to ensure accuracy. 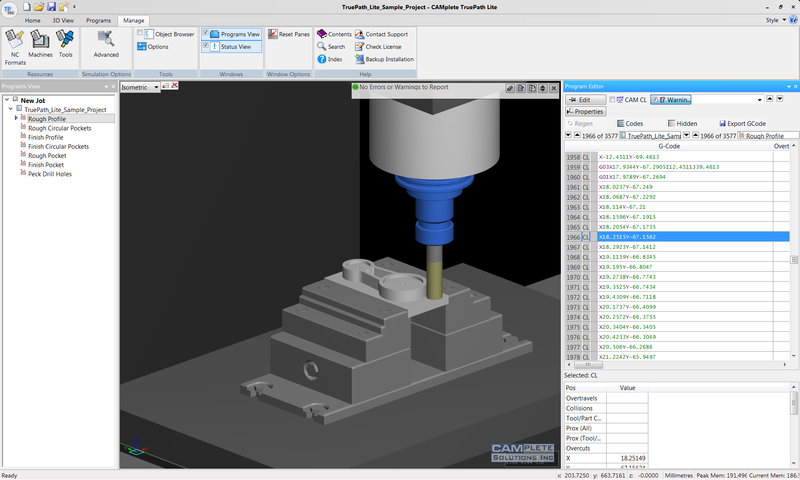 Because CAMplete works closely with machine tool vendors, many popular add-ons can easily be added to your model for even greater accuracy. You can easily import your fixture and finished part geometry to ensure that nothing is missed. This avoids costly collisions and helps keep your milling machines up and running. CAMplete TruePath Lite ensures the safety of every line of G-Code you run. Full simulation of your machines’ cycles and tool changes means that nothing is missed. With CAMplete TruePath Lite you can easily create and edit unlimited custom G-Code formats and apply them to any project. Standard formats developed in conjunction with your machine tool vendor are supplied so you can get started right away. CAMplete TruePath Lite is a Universal post processor. It’s easy to switch between different CAM Systems or combine tool paths from different CAM Systems into a single project. Just select your milling machine and NC Format; all your G-Code is output in a consistent unified format regardless of how you started. CAMplete TruePath Lite gives you an unprecedented level of control over your programs. Using CAMplete TruePath Lite’s sophisticated tool path editor you can modify the posted or un-posted tool path data. Regardless of what edit was made all data is kept synchronized, no need to post or un-post. If you like the product but use a 5-axis machine, check out how TruePath can help.